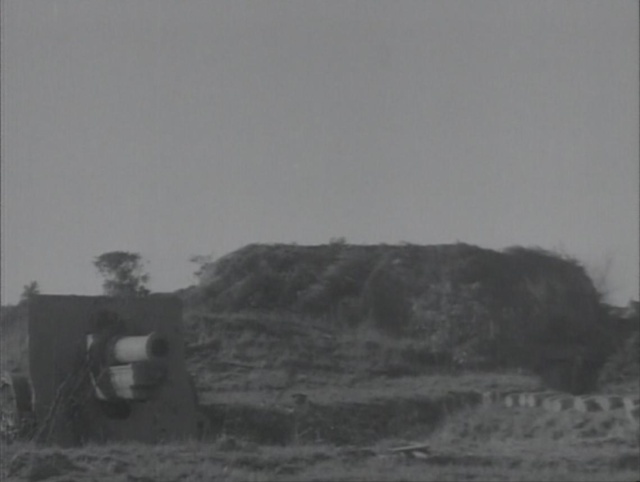 French captured guns also called 413 (b) , 17 (p) and (i) . please find attached three images from the Torremolinos park southwest of Malaga, Spain, where two original french 155mm guns of this type and two spanish post war licencemade ones still remain. Thanks for sharing these nice picture's , good to see the extra wheels for motorised transport ?? Yes, that's it, otherwise Howitzer would have the wheels broken. Here is a picture of a 15,5 cm sFH 414 in a Sockellafette (from Enzyklopädie deutscher Waffen by Gander&Chamberlain). Does anybody know where this picture was taken? I do not know any batteries with this kind of armament. The only two ones I know were situated in the test sites at Nymindegab and Blåvand. The first one was placed in a Regelbau 650 or 671, the latter in a Ringstand (probably a Bauform 73/271). But maybe the photo was taken before the gun was mounted in its bunker. The dunes in the background might be from Nymindegab or Blåvand. The rail could belong to a crane. Could it be the Channel Islands ? They sometimes had unique gun mounts: see for instance the "jaegerstaenden" with 10,5 cm K331(f) guns mounted behind unique shields unlike any other location in the AW (AFAIK). are some picture's of the 15.5 cm cm s.F.H. 414 (f) in Sk.L.IV in the instruction book D 2044 . But the background is retouched . Looks that the Socklellafette on your picture is not bolted to the emplacement ?? Well, as for Norway, practically all 15,5 cm sFH414 evacuated from the northernmost part of Norway late 1944 - early 1945 was put om Sk.Laf.IV in their new emplacements. This was planned for, and they just left the complete drehbettungen in the old positions. I think it is not Channel Islands. AFAIK there were no guns of this type there, and it is for sure a Sockellafette IV, not a Guernsey-Sockellafette. It could seem that the Sockellafette on the photo is not mounted yet, and there is a yardstick in front of it. Maybe the photo was taken for instruction purposes or something. Interesting that the sFH414s in Northern Norway were put in Sockellafetten. During the winter 1944/45 this was done for a number of 10,5cm K331s in the Bergen, Stavanger and Arendal areas, but I have no information about the northern part of Norway. Are there any photos of one of these sFH414s in their Sockellafetten? Here is a picture (ebay.com) of a 15.5 cm sFH414(f) with soldiers that look like Afrika Korps. The landscape matches a North African desert as well. Very nice. Where is the picture from?